I love how the Fairy effect in LunaPic changed this photo of the girls. I did go to PicMonkey and added some green to the eyes because that is what makes them stand out. It looks like you have 4 huge eyes looking at you from the woodlands. 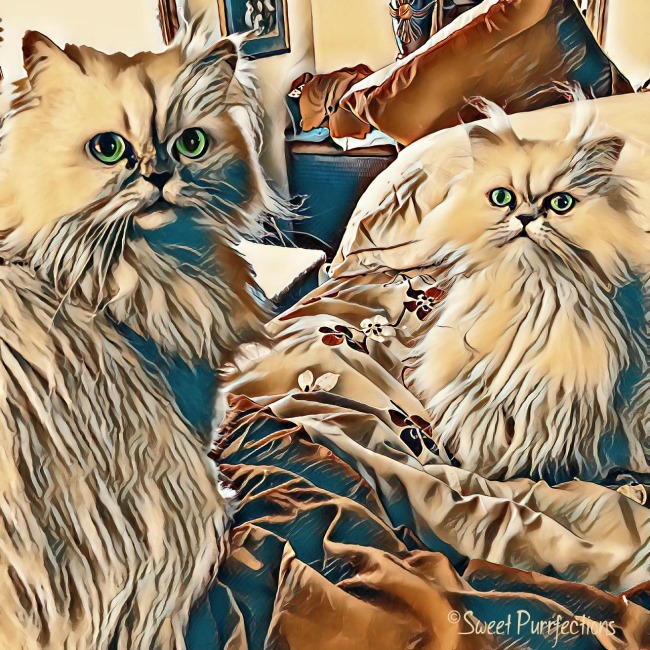 You can see more Caturday Art creations at Athena Cat Goddess. Wow....we're going to have to try that. It's lovely!!! That is an amazing effect - kudos on this pretty picture! The effects are amazing. Like clouds or waterfalls. You girls sure are pretty! Beautiful art, I love this effect. What cool art! I like this effect too. What a neat effect! You both look fabulous, and there's so much depth in this image! Wonderful art of the girls ... appropriate for them, too. That's is a stunning works of Art !